Obtaining higher scores on SAT tests. Building their vocabulary, comprehension, and word recognition skills. Developing their problem solving, oral expression, critical thinking and listening skills. Increasing awareness of and interest in current events. Obtaining a writing model which can assist them in their own writing. Opening a door to communication between students and parents. Acquiring an understanding of the importance of people, events, and issues in the news. Learning math concepts such as fractions, decimals, currency, and averages. Gaining a sense of awareness as to what is happening around them. "StudentNewsDaily.com is a non-profit current events website for high school students. Our goal is to build students’ knowledge of current events and strengthen their critical thinking skills. This is done by providing comprehension and critical thinking questions along with published news articles and other current events items from established news organizations. We provide resources that will enable students to become informed viewers and readers of the news." In my opinion, this website is also appropriate for middle school students. However, I suggest that you, as the parent, read some of the articles to make sure it's a good fit for your family. I've noticed that the content shared on the website seems to lean a bit towards the conservative side; however they do often include point of views from both political sides on various topics. It's then up to the student to form his own opinion based on the information provided. My son looks forward to reading the articles every morning. He appreciates the comic strips and videos shared on the website. I have heard him laughing on many occasions. He often tells me, "Mom, you have to see this!" As the parent/teacher, I like having the option of receiving a daily email which includes that day's headline news and a list of questions I can use with my student. Each morning after my son reads the main article, he writes a title for it in his own words. On Fridays, he chooses one article from that week and summarizes it. As listed in number 8 above, having my son studying current events has led to many interesting conversations between him, his father, and me. I can see the confidence in him as he shares information that is new to us and as he conveys his opinions. You can read StudentNewsDaily.com either online or you can download their FREE app onto your iPhone, iPad, Android phone, or Android Tablet. 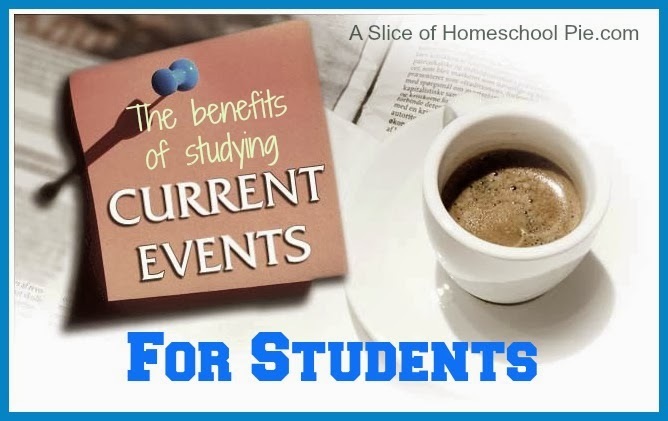 If you haven't added the study of current events to your student's schedule, I highly recommend that you consider doing so. If your child has been studying current events, what are some resources he/she uses? Please share them with us below, under the comments section. If you found this article useful, don't forget to Pin it for later! We watch CNN Student News each morning to start our school day. I am not familiar with CNN Student News but will check it out.
. You ought to examine on what should be help with paper writingpossible to have an engaging occasion. he teachers themselves in this manner should outdo education,visit website so they can thus help prepare students in the best of ways.